Many law firms fail even when they have an abundance of clients. Why? They fail to measure, track, and act on key performance indicators (KPIs) or performance metrics. KPIs are gaining attention in the legal field and, more importantly, firms are shifting their focus from measuring utilization and profit per partner to measuring outputs that include value for clients. Ultimately, you are providing valuable services to your clients and, therefore, it is critical to measure and monitor your client satisfaction in addition to the cash received. 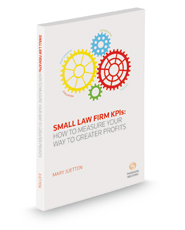 Small Law Firm KPIs: How to Measure Your Way to Greater Profits teaches you the business basics you need to run your business successfully, improve client satisfaction and cash received, and have a solid measurement system in place that shows the value of your firm. The book provides straightforward guidance and examples on what performance metrics matter, how to collect those measurements, how to interpret and evaluate the results, and how to implement strategies to improve your profits.